For several years I taught in a special program for intellectually gifted students. These were 28 sixth graders who had a variety of strengths in writing, math, and the sciences. They were all deep thinkers and I did for them what I’ve always done with students: Find out what they know and can do and then push them further. Every child deserves growth no matter their starting point. That part was easy. A more challenging aspect were the social-emotional needs. Gifted is a loaded word and many of these bright youngsters would have traded their ‘gifts’ to be normal. Concerns with identity and fit, heightened sensory functions, perfectionism, anxiety, and underachievement took up 90% of my time. This new book by Stacy McAnulty would have been a good one to use with those students. Lucy Callahan wasn’t born gifted. Her intellectual skills came about after being struck by lightning. It’s a real condition called Acquired Savant Syndrome. She lives with her grandmother and is home schooled until Grandma decides it would be best if she went to middle school for a year. Uh-oh is right. The depiction of middle school here is one of the most accurate I’ve come across—both for students and their teachers. Lucy’s first person narration hides the fact she is a Math genius. What she can’t hide are her OCD tendencies. She counts everything and has to stand and sit three times before settling down. Lucy does make a few friends and one huge enemy, but the heart of this story is accepting differences. We can’t all fit into the same box. The ending was not an ending but instead provided hope. We need more contemporary dramas like this one. Her two friends, Windy and Levi, are so different but also much needed in her life. They provided the spark that kept the story moving forward. The group project is something kids dread or cheer depending on who they get to work with. The dog shelter sub plot for Lucy was a gem. Canine lovers may shed a tear for the plight of many of these dogs. Levi’s I don’t care exterior could have stayed that way throughout. Instead, what breaks out is a very caring individual. Great character arc. There’s a big gift to math lovers here with Lucy’s infatuation with Pi and her natural calculator brain. But those who despise math should not stay away as your side of the equation is also portrayed. Mr. Stoker is the kind of teacher we should all have a chance to meet and learn from. The best decision Nana ever made was taking me out of public school. Now she wants to send me back. Obviously, her judgment is deteriorating. You can also read the first chapter here! In no particular order… I’m a wife, mother of 3 kids and 3 dogs, author, daughter, sister and stepsister, aunt, friend, Twitter addict, mechanical engineer (currently inactive), inconsistent blogger, Packers fan, two-finger typist, concerned citizen, book-buying enthusiast, reluctant volunteer, minivan driver, pancake flipper, snooze-button hitter, and coupon clipper. 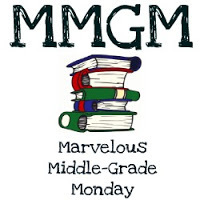 This entry was posted in Middle Grade Book Reviews, Reviews and tagged Marvelous Middle Grade Monday, Middle Grade Book Reviews, Stacy McAnulty, The Miscalculations of Lightning Girl. Bookmark the permalink. This sounds like a book I wold enjoy. Adding it to my TBR, thanks for sharing! I need to read this book and share it! I recently saw a story about acquired savants, but most were adults. One was struck by lightening, another had a traumatic brain injury etc. But, the talents that came resulted were incredible. A young man became a talented artist etc. Being adults, all seemed to embrace their new talents. I never heard of acquired savants. How weird but at least a good result of being struck by lightening. Sounds like a great read. I simply loved this book and you nailed all the reasons why. Thanks for the reminder of these wonderful characters and their story. I have this book on my birthday list as it’s a must read for me ever since I first read about it. I love books that have bright kids at their center.